Moroku is passionate about building long term value by helping kids learn the fundamentals of banking and including them in the financial system. Our beliefs create our reality and if we can influence these positively magic can happen. Fintech companies are targetting the Millennials market segment across the world and challenging existing banks and credit unions. This is born out of a demand by digital natives and because they will become the most profitable banking segments in the very near term as shown by this recent research by Telstra. The Commonwealth Bank of Australia (CBA) is the largest bank in Australia and one of the largest by market capitalisation in the world. Much of the banks success is attributed to its children’s banking strategy “Dollarmites”. Created in 1931, CBA enabled schools to act as branches, taking deposits from children in reward for a range of incentives. These include giving schools $5 per account opened. In 2016, the CBA paid $2.3 million in commissions to schools. Today about one-third of 18 to 34-year-olds nominate the Commonwealth group as their main financial institution. 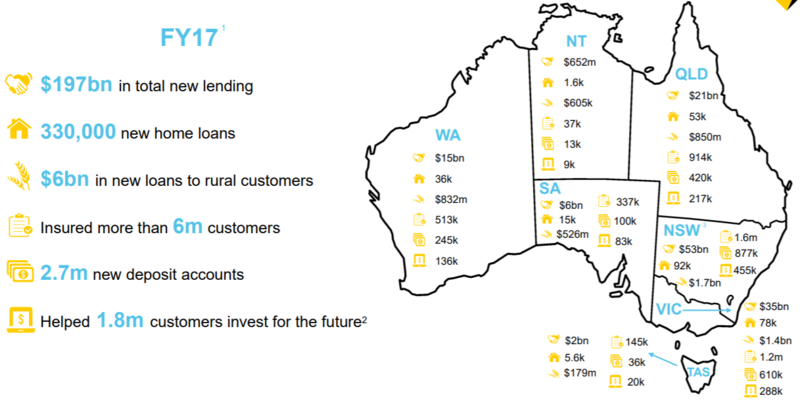 This younger demographic is a leading indicator of future growth at the Commonwealth given the “exceptionally low likelihood” of customers switching between banks for their core financial relationship as indicated by the numbers: 16.6 million customers in a country of 24 million people and some solid FY17 results. Created in 1931, CBA enabled schools to act as branches, taking deposits from children in reward for a range of incentives. These include giving schools $5 per account opened. In 2016, the CBA paid $2.3 million in commissions to schools. Today about one-third of 18 to 34-year-olds nominate the Commonwealth group as their main financial institution. 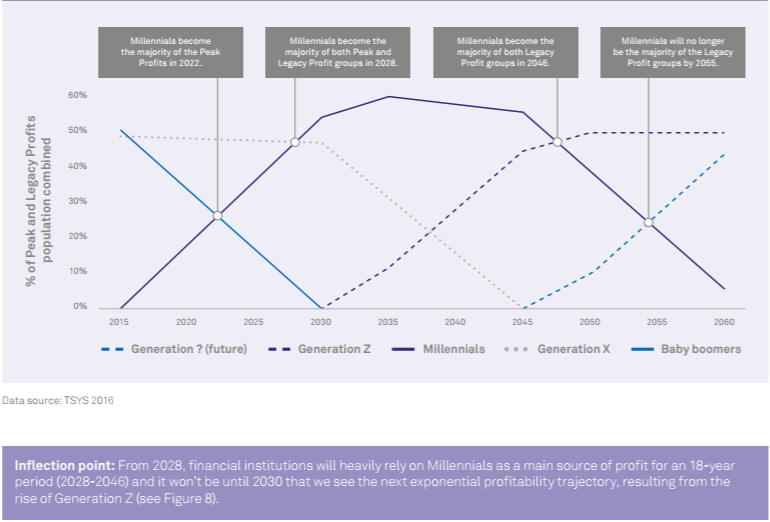 This younger demographic is a leading indicator of future growth at the Commonwealth given the “exceptionally low likelihood” of customers switching between banks for their core financial relationship as indicated by the numbers: 16.6 million customers in a country of 24 million people and some solid FY ‘17 results. This presents a fabulous model to build upon. If banks can build a digital banking platform that is relevant to children, Gen Z, they can emulate CBA and get ahead of the Millennials segment. This plays to the incumbent’s strength; their existing customer base, their customers who are parents and grand parents who can be used to bring their children into the bank. If they build the model well they should be able to create a network effect, bringing not only the children in but the extended family as well. What has been illuminating on the recent study tour of the USA is that whilst some banks can open children accounts, few have a strategy or program to do so. This means that Moroku’s children’s mobile banking app, Chore Scout, is not only a cool idea but one which could be about to create a brand-new banking segment in the Americas. Being first is not critical for success. Nor does being first guarantees success. Taking first mover advantage is however certainly a massive advantage if you are capitalised well enough, move fast, learn and take the advantage. According to research by CBA, almost half of Aussie parents, 43 percent, said it was difficult to teach their kids about digital money or digital transactions. Forty two percent of those who have participated in the study believe technology would make it easier to track savings goals online and 41 percent of parents say monitoring kids’ spending via a device or computer would be simpler. Beliefs create reality. We know if that we can instil good financial skills in children early, they are a gift for life. Building the next generation is important from low to medium income groups all the way through to the families of high net worth customers and business owners. 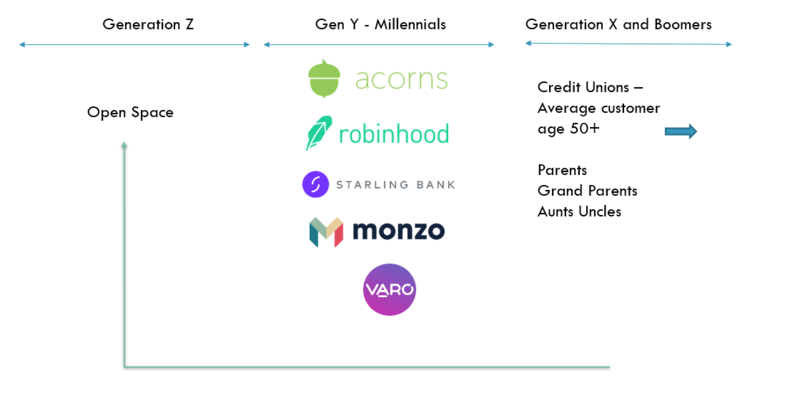 With generational poverty facing epidemic proportions, building a strategy for multi-generational customers based on financial literacy seems core to a sustainable strategy; one that allows banks to compete on purpose, build a great base and compete. The next generation of the child’s app is very exciting. We have long been searching for a platform that will allow us to build apps that are more fun and have a single code base, as opposed to having to have an iOS and Android app. We think we have found it and the early results are promising. As we learn how to do this as well as help our banking partners create the network effect we aim to help them surround the Challengers and build long term sustainable value.